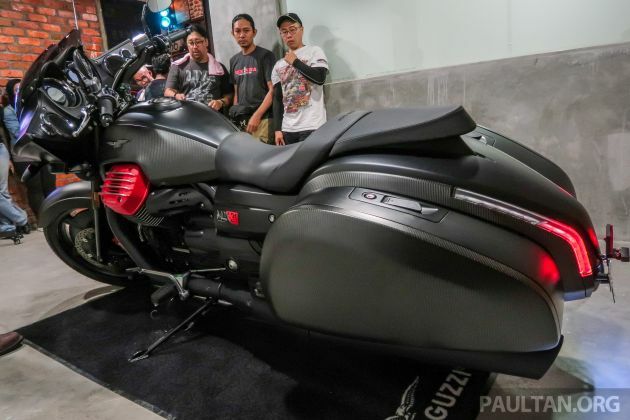 Available by special order, the 2019 Moto Guzzi was unveiled in Malaysia and is priced at RM172,000, excluding road tax, insurance and registration. Designed in the bagger style, with low slung rear boxes and large handlebar mounted fairing, the MGX-21 has been given the moniker “Flying Fortress” and is Moto Guzzi’s flagship touring rig. Meant to travel long distances in comfort, the MGX-21 was first unveiled in 2017 and is meant to be a showcase of Moto Guzzi’s engineering prowess. The MGX-21 power plant uses Guzzi’s trademark transverse air-cooled V-twin, displacing 1,380 cc and producing 96 hp at 6,500 rpm and 121 Nm of torque at 3,000 rpm. Power gets to the ground via a six-speed gearbox and shaft final drive, with fuelling done by Magneti Marelli using ride-by-wire. This allows for three-level traction control and the MGX-21 comes with three ride modes – Veloce, Turismo and Pioggia, translating to Sport, Touring and Rain, respectively. Also standard fitment is two-channel ABS and cruise control, as befits the MGX-21’s intended purpose as a touring cruiser. The MGX-21 is decked out in carbon-fibre and in terms of riding accessories, inside the cockpit is a monochrome LCD display and entertainment system with 25 W per channel amplifier. Bluetooth connectivity also for the connection of up to five devices, including the rider’s smartphone. This gives the rider the ability to make and receive phone calls and manage the music playlist. Of note is the 21-inch front wheel, with carbon-fibre covers over an aluminium alloy base that gives the MGX-21 a distinctive front-end. Brembo does the braking for the MGX-21, front and rear, with radial-mounted four-piston callipers on the front stainless steel floating discs. Suspension in the front is with 45 mm diameter telescopic forks while the rear end is propped up with twin remote reservoir shock absorbers adjustable for preload and rebound. The saddle sets the rider at 780 mm off the ground and wet weight for the MGX-21, without fuel, is said to be 341 kg. 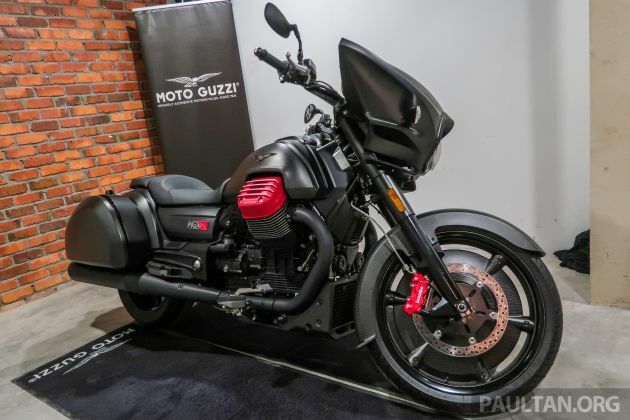 Orders for the 2019 Moto Guzzi MGX-21 can be placed at the Moto Guzzi showroom in The Gasket Alley, Petaling Jaya. Wat an overly bold design, with the engine top exposed near to the ride’s thighs. Enjoy the sauna guys and burn your thigh fat..
if “Flying Fortress” cost RM172,000.00… I wonder how much flying cars gonna cost?